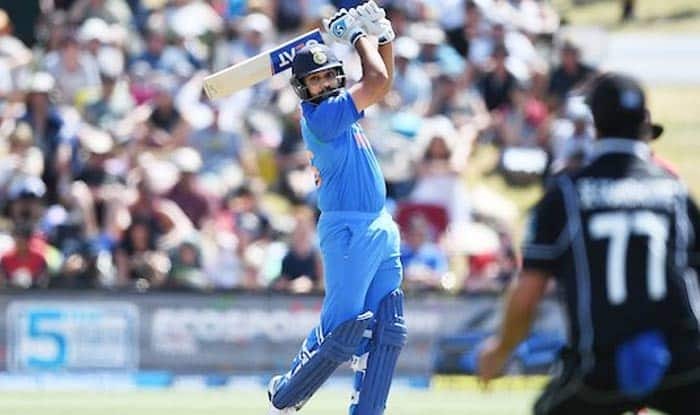 India vs New Zealand 2nd T20I: Stand-in captain Rohit Sharma went past Kiwi Martin Guptill to become the leading run-getter in T20I history. India vs New Zealand 2nd T20I: Stand-in captain Rohit Sharma went past Kiwi Martin Guptill to become the leading run-getter in T20I history. Rohit needed 35 runs before the Auckland tie started and he got there in no time. The Mumbai Indians captain also joined Chris Gayle and Martin Guptill to become only the third player to hit 100+ sixes in T20Is. Rohit has been in ominous form with the bat in limited overs cricket and the Men in Blue would hope he gets going and takes India over the line. The India opener also went past Shoaib Malik in the process. The Pakistani has also been a phenomenal T20I player, he had 2263 runs, whereas Guptill was on 2272. In the meanwhile, he also became the fastest Indian captain to breach the 500-run-mark in T20I cricket, he went past Kohli to the record. He also created the record for hitting the most number of boundaries in T20I history. Earlier, Krunal Pandya enhanced his already growing reputation as a steady short format bowler with three important breakthroughs as India restricted New Zealand to a below-par 158/8 in the second T20I on Friday. The parsimonious Krunal (3/28 in 4 overs) dismissed Colin Munro (12) and skipper Kane Williamson (20) to peg the Black Caps back. In between, Krunal also got the controversial wicket of Daryl Mitchell (1), who fell prey to an umpiring howler, when ‘Hotspot’ showed a clear inside edge onto the pads. However, Colin de Grandhomme, who has played for KKR in the IPL, then counter-attacked, scoring a blistering 50 off 28 balls, adding 77 runs with Ross Taylor (42 off 36 balls) for the fifth wicket. Once De Grandhomme was sent back to the dug-out by Hardik Pandya (1/36 in 4 overs) and Taylor was run-out, New Zealand’s chances of a big total went up in smoke.